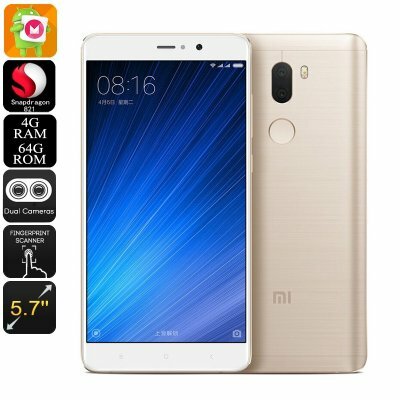 Successfully Added Xiaomi Mi 5S Plus Android Smartphone - Qualcomm CPU, 4GB RAM, Android 6.0, Dual-IMEI, 4G, 13MP Cam (Gold) to your Shopping Cart. With its 64-bit Qualcomm Snapdragon 821 CPU, the Xiaomi Mi 5S Plus packs some of the latest and most trusted processors available in the mobile industry. This powerful Quad-Core CPU has been clocked at an astonishing 2.35GHz, allowing you to smoothly run demanding applications and mobile games alike. Along with its state of the art CPU, this Android smartphone furthermore packs a stunning 4GB of RAM thanks to which it is capable of running multiple of its features simultaneously without dropping a frame. Play demanding games, enjoy the latest applications, or stream a FHD movie online – there is nothing that will slow this beautiful Xiaomi phone down. Packed within its sleek body you’ll find the phone’s 5.7 Inch Full-HD display that portraits all your favorite media in breathtaking 1080p resolution. Featuring 64GB of internal storage, this Android phone holds more than enough space for you to save all your media and files. To make sure that nobody but yourself has access to all your private files, pictures, and media – the Xiaomi Mi 5S Plus has been equipped with an ultra-fast fingerprint scanner. Not only provides this fingerprint scanner ultimate security, it also lets you unlock your phone in the blink of an eye without needing to remember any passwords or unlocking patterns ever again. For all mobile gamers out there, this Android smartphone holds the Adreno 530 GPU - a graphic unit that lets you enjoy clear visuals, vivid color, and stunning detail. From now on you’ll be able to tackle the most graphically demanding smartphone games without dropping a frame and never have to feel bored again. Simply head out to the Play Store where you will find the latest mobile applications, games, and more. With this Chinese smartphone in your pocket, you’ll be able to enjoy days’ worth of entertainment no matter where you’re at. Along with its powerful 3700mAh battery, this latest Android phone supports numerous hours of continuous usage time – letting you browse the web, watch movies, and play the games you love most throughout the day without needing to worry about battery life. With its Android 6.0 Operating System, the Xiaomi Mi 5S Plus packs all the trusted and latest features that Android users are familiar with. Its Dual-SIM card slots allow you to insert two SIM cards at once that, thanks to the phone’s two IMEI numbers, can both be active simultaneously. Besides its Dual-IMEI numbers, this Android phone furthermore supports 4G and Dual-Band WiFi, providing you with the fastest data speeds out there. Whether you’re at home, in the office, or enjoying a cup of coffee in the city – with this Android smartphone you’ll always be able to stay connected to your friends, family, and loved ones. The Xiaomi Mi 5S Plus comes with a 12 months warranty, brought to you by the leader in electronic devices as well as wholesale electronic gadgets..
Arabic: - الروبوت الذكي 6.0 - Chinese Simplified: - 6.0 的 android 智能手机 - Czech: - Smartphone se systémem Android 6.0 - Danish: - Android 6.0 Smartphone - Dutch: - Android 6.0-Smartphone - French: - Android Smartphone 6.0 - German: - Android 6.0 Smartphone - Hebrew: - הטלפון החכם אנדרואיד 6.0 - Hindi: - एंड्रॉयड 6.0 स्मार्टफोन - Italian: - Smartphone Android 6.0 - Japanese: - 6.0 の android スマート フォン - Korean: - 안 드 로이드 6.0 스마트폰 - Malay: - 6.0 pintar telefon Android - Norwegian Bokmål: - Android 6.0 Smartphone - Romanian: - Android 6.0 Smartphone - Russian: - Смартфон Android 6.0 - Spanish: - Android Smartphone 6.0 - Thai: - สมาร์ทโฟน android 6.0 - Turkish: - 6.0 Smartphone Android - Vietnamese: - Điện thoại thông minh Android 6.0.